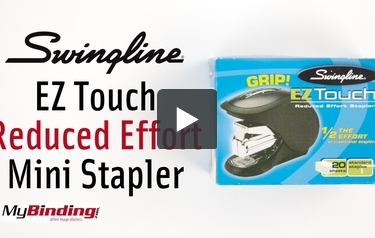 Stapling with Swingline LightGrip Reduced Effort Mini Stapler has never been easier! Its compact size is convenient for any workspace or classroom. There is an easy drop-in staple loading, so no more frustrating attempts to reload. This stapler holds 50 standard staples and has a manufacturer's limited one-year warranty. Welcome to MyBinding Video. This is the EZ Touch Reduced Effort Mini Stapler from Swingline. The easiest stapler is an EZ Touch Stapler. It’s a compact little thing, with a great ergonomic design. You can load up to 50 staples and there is an indicator for when you’re low on staples. It can be used handheld or on a desk and uses the powerful fulcrum to fasten up to 20 sheets of paper. It’s a great little stapler just waiting to be a part of your workspace. Swingline backs it up with a one year warranty. For more videos and all your binding needs, visit MyBinding.com. The LightGrip can fasten documents that contain from 2 to 20 pages. This is a pretty standard stapling capacity for a desk stapler and it should be fine for everyday documents. However, if you think you'll need to work with thicker documents, you may want to choose a heavy-duty device instead. As the name suggests, you don't need to have a really firm grip to use this stapler. It responds well to the lightest touch so you'll use far less effort than you would with a typical stapler. In fact, you'll use up to 50% less effort, which is quite a lot. This device is able to respond to such light pressure thanks to a metal stapling mechanism. The LightGrip is nicely designed and it has soft material on its exterior, so you'll find that using it is a comfortable experience. It also fits easily into your hand and you'll be able to use it a lot without getting tired. The LightGrip is a rather compact device so it will fit easily on your desk, no matter how cluttered it may be. Since it's so small and lightweight (it weighs less than half a pound), you could even take it outside of the office and use it to staple documents on-the-go. This device can accept staple strips that are compromised of up to 50 fasteners. That should be more than enough to get you through a typical work week. If you want a high-quality device that's been durably constructed, the LightGrip would be a good choice. It's made from a combination of metal and plastic parts so you'll be able to get a lot of use out of it even if you use it everyday. This product is reasonably priced so it's a good choice if you need a high-quality stapler but don't want to spend a lot of money. Plus, it comes with a limited one-year warranty. The Swingline LightGrip is really a good little stapler. It's terrific that it's easy to use and that using it requires much less effort than typical staplers. This device will feel comfortable in your hand even after you've used it for a while. The only thing about this product that could really be improved is its stapling capacity. As mentioned earlier, this device will be able to handle everyday jobs (i.e. stapling correspondence, bills, etc.) but since it can only fasten up to 20 sheets, it's not going to cut it if you need to staple larger documents. However, if you just need a small stapler to handle short documents, the LightGrip is a terrific choice. Get one for your desk today.